Apple picking season can vary depending on the weather and conditions, but generally runs through from late August or early September through to late November, with dozens of different apple varieties ripening up and getting ready to be plucked from the trees and turned into all sorts of treats from apple pies to apple sauce or even cider. When it comes to apple picking in the United States, New York is one of the top places to be. The state boasts dozens of different varieties and literally hundreds of farms and orchards that people can visit and pick hundreds of apples for themselves each and every day. 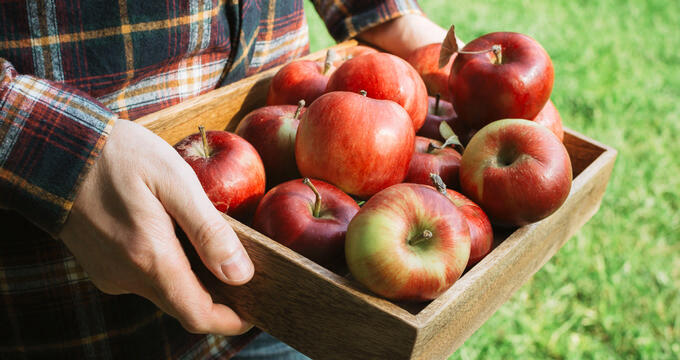 New York is one of the biggest producers of apples anywhere in the US, and the beautiful little village of New Paltz, NY is a great place to begin your apple picking journey. A historic and picturesque village that really comes to life in the fall, New Paltz boasts several great apple picking locations in its surrounding area. Offering scenic views of the nearby Catskill and Shawangunk Mountains, Apple Hill Farm lets you enjoy the beauty of nature in more ways than one. This pet-friendly farm is well-known for being one of the most welcoming apple picking locations in Rochester, starting off its apple picking season in early September with McIntoch apples, as well as Cortland, Spartan, and Opalescent. As the season continues, Red and Golden Delicious apples will also become available. This location offers hayrides too, as well as the opportunity to purchase delicious, homemade apple products like cider and donuts. Guests are also encouraged to bring their own picnic baskets and really turn their apple picking experience into a full day of fun. Boasting 200 acres of land, Jenkins-Lueken Orchards is one of the biggest apple picking spots, not only in the New Paltz area, but in all of the Hudson Valley. This family owned and operated orchard has been in the business for decades now and is open all year long for various activities, including apple picking, but also pumpkin, raspberry, blueberry, and blackberry picking. Providing beautiful views in every direction, this orchard is a lovely place to spend a day with friends, family, or a special someone. This orchard actually boasts one of the longest apple picking seasons of any New York location. The season usually starts in mid-July with Tydeman and McIntosh apples, with around 20 more varieties becoming available in the weeks and months that follow. This orchard has a lot of variety, with Fuji, Empire, Gala, Golden Delicious, Macoun, Braeburn, and many other types of apple available for picking. Visitors can also buy fresh produce and baked goods from the farm store. The fine folks at this fifth-generation family farm will welcome you with open arms when apple picking season gets started in early September. The season normally runs through to the end of October, with 400 acres of apple trees and 20 different varieties to choose from. This individual farm is a huge producer of one of the world's favorite fruits, shipping around 4 million pounds of apples off around the US each and every year. Strawberries, peaches, and pumpkins are among the other great fruits you can pick at this location, which also offers cider, a farm stand selling an array of delicious fresh produce, and a homemade ice cream stand with a myriad of delicious flavors including chocolate chip cookie dough, Hudson Valley sweet corn, and more. For a full day of tasty excitement, Dressel Farms is one of the top spots in New Paltz, NY.